In my ongoing quest to find savory breakfasts that don't include egg, I've decided it's okay to eat yogurt on toast in the morning. Especially if that yogurt is served warm with spinach, nuts, and saffron. To be fair, you could eat this at any time of day, but it's quick to whip up and involves lots of energy foods so makes for a nice start to the day (and to the year). Hi 2016! I'm back at work now and winter has finally arrived in Washington, which means I need a balance between warm cozy foods to keep me alive and healthy January foods to keep me from exploding from all the extra cheese and booze I consumed over the last two weeks. I also need to invest in gloves (how do I not own any gloves)? Warm yogurt may seem a little odd, but the saffron makes it almost more like a sauce that goes with the spinach... think of this dish like a tart deconstructed creamed spinach. Or is that weird? Maybe just think of it like a delicious warm winter breakfast. Steep the saffron in 3 tbsps warm water and let sit for 5 mins. Remove threads and mix the saffron water into the yogurt. Season lightly with salt. Wash and roughly tear/chop the spinach. Heat olive oil in a frying pan and cook the spinach. Once cooked, season with lemon juice, salt and pepper. In a small frying pan, gently toast the pine nuts. 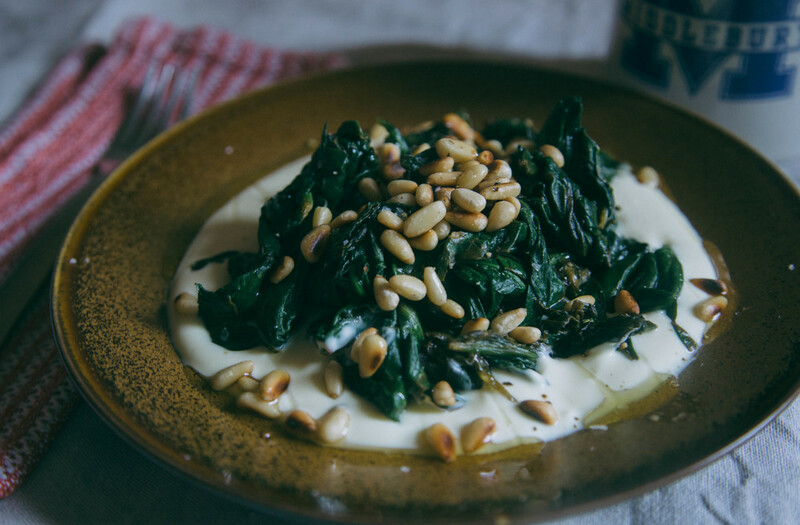 To assemble, spread yogurt on a plate, top with spinach and pine nuts. Drizzle with olive oil and season with salt and pepper. (The dish can be eaten at any temperature, but I usually microwave it for 30 seconds before spooning it onto hot buttered toast).